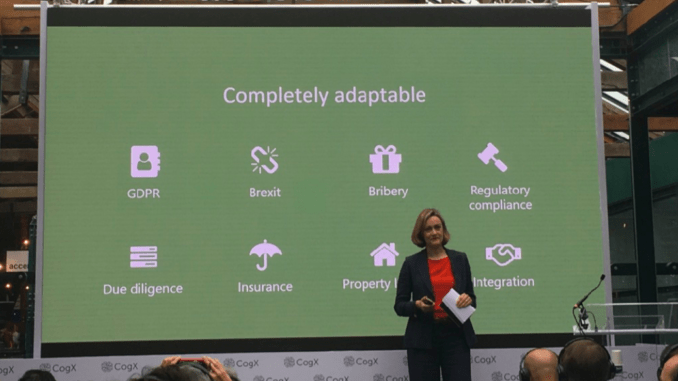 Once a year UK-based CogX brings together everyone in the realm of AI and Artificial Lawyer went along to hear the combined double panel featuring four speakers on the subject of legal AI. After a bumpy start where the stage introducer invoked the infamous Shakespeare quotation about ‘killing all the lawyers’, which triggered some boos and heckling from the back of the room – and perhaps not in an ironic fashion either – we kicked off. First up was Emily Foges from Luminance, followed by Gary Gallen from rradar. Gallen always gives interesting presentations, though it’s not always 100% clear what rradar does. 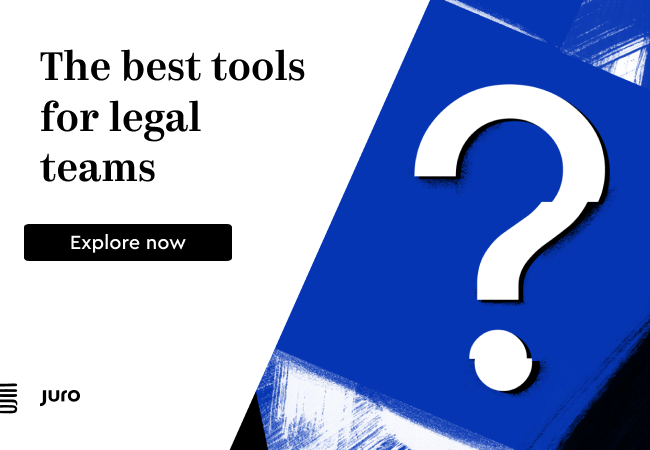 Perhaps the easiest way to describe it is that it’s an expert system that provides a Q&A platform for questions on a range of legal topics. And that is essentially what all expert systems are doing, whether the most basic pre-set chat bots, or the most advanced systems with highly developed NLP capabilities. Now onto doc review with Foges setting out very clearly how far Luminance has come in a short space of time since setting up back in September 2016. 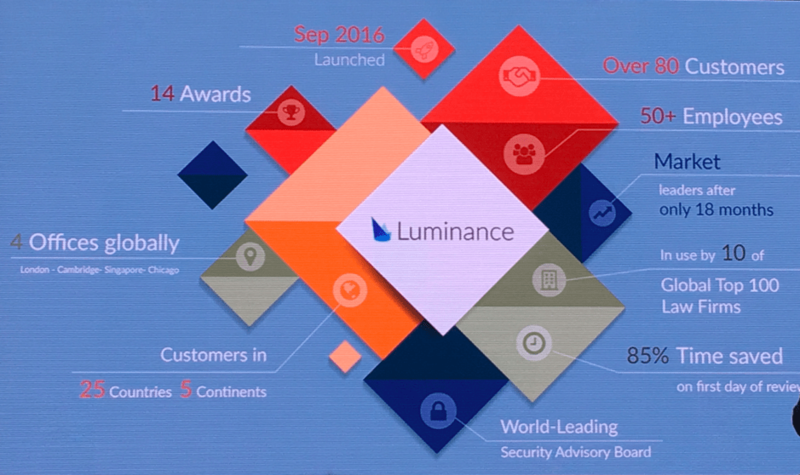 In fact, one could see Luminance’s growth as a bellwether for legal AI adoption around the world and the interest in it, albeit it’s just one yardstick among many. Also at a granular level the amount of use each firm gets from the system will vary, but as a snapshot of a single business that sells legal AI services then it remains a useful benchmark. Foges presented a useful slide (see pic below) of where they are now. They have 80-plus customers, in 25 countries, and now four offices in three countries, UK, US and Singapore. As noted, just because you have lots of clients doesn’t mean they’re leveraging your AI system in every transaction that they have. But, nevertheless, the company’s rapid expansion shows that selling AI technology to lawyers is a growth market. Foges also set out how the company is expanding in terms of working on not just M&A, but a wide range of doc review use cases, from compliance to property matters. Clients range from two-partner firms (rather killing the idea that AI is only for the big firms), to corporates, Foges added. She explained that in terms of Luminance’s approach, the way they saw the adoption of AI was all around focusing on a ‘clear goal’, then using AI to achieve that. I.e. different law firm partners want very different things, hence corporates in some ways would be easier clients, which is the market legal AI companies such as Seal Software have focused on. Foges also noted that LPOs and the Big Four were ‘very interesting’, no doubt because they can strategize more like corporates and focus on business goals and work processes in a way that some partnerships may find harder to do. We then moved onto use cases, and GDPR naturally came up. Foges pointed out that the legal world will continually be faced by huge review tasks because of regulatory change, whether GDPR, Brexit, or something else. It was a constant now. One aspect that struck Artificial Lawyer was Foges’ highlighting of the fact that bringing in teams of junior lawyers and paralegals to do a review task of a large corporate’s documents introduces a novel problem, namely a lack of familiarity with your business. ‘When you use paralegals [for a review task] you don’t know them, and they don’t know your business,’ she said. The alternative was to use an AI system such as Luminance that allowed the inhouse legal team to look for information that the company’s lawyers were generally familiar with. She also noted that in one example, an inhouse legal team had been able to power through nine weeks of review work in seven days using Luminance, providing a time saving of 85%. Foges then returned to her key point: using an AI system that you can steer and teach, means ‘not losing control’. Then we moved onto the main panel and a series of questions by James Kingston from CogX that covered a broad range of topics around the area of AI use and adoption in the law. Nick West, of Mishcon, noted that there are many uses for machine learning tech in a law firm, from helping with hiring to time recording. By way of example, he mentioned Ping, a startup for time recording that was one of its first cohort in the MDR LAB incubator. Ping helps the firm to predict what matters should cost and how much they should charge clients. He also noted that this year’s MDR LAB programme had 136 applications, but they only chose five of these to come to Mishcon to be part of the second cohort. ‘Legal tech is still a nascent industry, it needs help. Not everyone knows what problem they are solving, or they have misunderstandings about legal practice, even sometimes when the founders [of the startups] are lawyers,’ West said. Partha Mudgil COO, of Nakhoda at Linklaters came at the issue from a different perspective. ‘We can see legal businesses as risk mitigation businesses,’ said Mudgil. He talked about the derivatives margin calculator system they are making with ISDA and stressed that this was a great opportunity to collect new data as the product was used to improve things. But Mudgil also noted that in the law there was a strange disconnection between the tech that lawyers used in daily life and the tech they used at work. He pointed out that the tech in a restaurant recommendation app on a smart phone was quite advanced, yet the idea of using machine learning systems (as one would find in such apps) still seemed unusual to lawyers when you suggested they use it in contracts. West then took up the issue of tech adoption barriers. He pointed out that ultimately this was all about the clients. ‘Law firms have a Pavlovian response to what clients want. They spring into action,’ he noted. West then gave the example of a piece of work they had done using an AI system to speed lease analysis. There were 77 commercial properties that resulted in over 1,000 leases, each many pages long. He estimated it would have taken an associate about 2,000 hours to do this work. Or, an entire year’s work, just to extract some data from documents. Clearly the client would not accept this. Or, even if they put a team of lawyers onto this work, it would still be a very long task in terms of total hours. In such a situation tech was the answer, even if just for a first review to get a better understanding of the documents and the legal data contained inside them. ‘The more clients push, the more it will move the needle. The more client pressure the better,’ said West in terms of tech adoption. Automated dispute resolution: it will be a very long time before judges are replaced, if ever. Should AI systems give actual advice? The panel was split. Foges said no. Gallen said yes. Though, how we define ‘advice’ is perhaps the real issue here. Also, check out the earlier story at CogX about the future of automation – here.